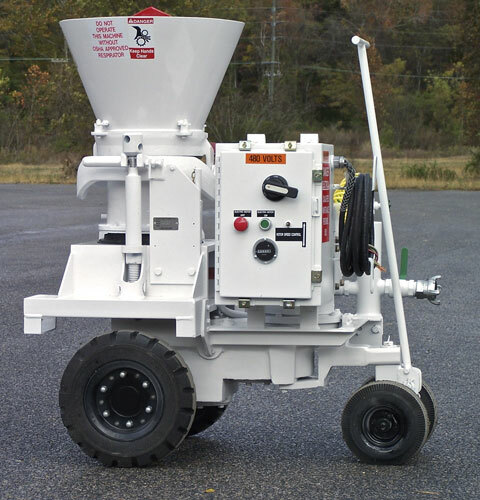 ANNISTON, Ala. – Blastcrete Equipment Company’s AA020 Piccola Rotary Gunite Machine is designed to be easy to own, operate and maintain. Featuring proven Piccola technology for precise, effective operation, the gunite machine is ideal for a variety of applications, including dry and underground shotcreting, concrete repair and refractory installation. Blastcrete’s Piccola gunite machine is intended to be a simple solution for gunning applications up to 6-cubic yards per hour. It offers precise material output, with the ability to deliver a maximum of 3/8-inch aggregate. Designed for user-friendly operation, the Piccola machine features a simplified one-bolt clamping system. Unlike similar systems that typically include three to four adjustment bolts to seal the clamping plate to the rotor, Blastcrete’s requires just one bolt. This simplified design makes it quick and easy to adjust, and ensures an excellent seal each and every time. A good seal will prevent dust leakage around the rotor and is essential for optimal results. The Piccola machine is also designed for trouble-free cleaning and maintenance. The entire unit can be taken apart easily for quick, effective cleaning and convenient access for routine maintenance. Featuring a small, compact design, the Piccola machine is designed for easy transport and fits in the bed of a pickup truck. It’s mounted on solid rubber tires for mobility, and also available skid mounted with forklift pockets. Power options on the unit are either a 5-hp electric motor or 16-AM Gast air motor. Air requirements are dependent on power choice, and range from 250 to 600 CFM.